HOW TO ACHIEVE THE OPTIMUM RESULTS . . .
Judging dogs is very subjective. There are many things to consider; however, some judges choose to use the "Rule of Five" to evaluate the breed characteristics (or lack thereof) in each exhibit. The Rule of Five simply says: "The easiest way to judge a dog is to look at the sum of the parts, not the individual parts." There are only five properties that must be assessed using this approach. These five properties are listed below alphabetically, rather than by priority as this will vary from breed to breed depending on the particular breed's primary function. 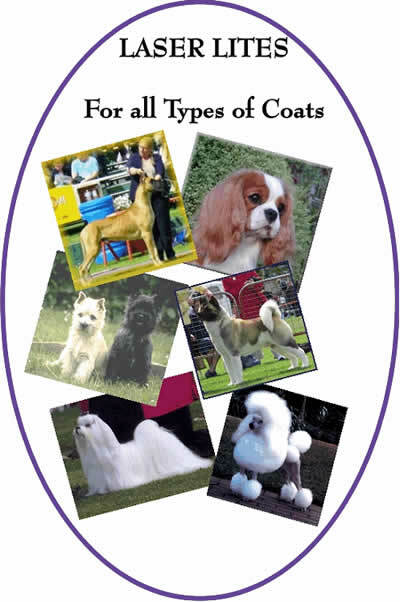 In this article we will be presenting breeds in categories according to coat texture relevant to their breed standard. In each of these categories we will be giving examples of breeds. Unfortunately we are unable to name every single breed with relevant coat texture for each Group; however, I am sure that you will be able to ascertain which category that your breed (or any breed not listed) will fit into. Fundamentally, categories range from short / medium coated breeds, (with or without fringing), through to bouffant, coarse, harsh / hard , and silky / flowing. Within these categories we also encounter single versus double coated, coarse to soft fluffy bouffant and coarse wiry to harsh textured. Throughout the Laser Lites range we have products to suit all coat textures. We have products that simply maintain a correct coat texture to products that can enhance an incorrect coat texture to bring it to the optimum for the breed requirement. And we have products for maintenance ie non-show finish. Further, because no two dogs have identical coats (not even within the same breed) we sell core products plus additives so that you can customise your own formulation that will be just right for your particular dog. Let's commence by discussing the individual coat types. All Laser Lites shampoos and conditioners are designed to be diluted according to usage e.g. bathing in a tub (typically dilute 10:1), or bathing in a hydrobath (typically dilute 100:1). All Laser Lites shampoos are manufactured to be low sudsing to prevent excessive suds during hydobathing. Due to the pH balance of all Laser Lites shampoos and conditioners you are able to use them in the concentrated form without fear of harm to an animal's skin or coat. And the correct pH reduces dandruff. Because the shampoos are low sudsing, and most of the conditioners are leave in, the amount of water required to bathe an animal is significantly reduced. Please click below to go to specific discussion on the following coat types and for a more detailed look at Laser Lites and the whole range of products ! !